War looks imminent and tensions are mounting. In 1812, at what is now Fort Wayne, Indiana, James’ family runs the trading post. Anikwa, a Miami Indian, helps reinforce his family’s reed house. 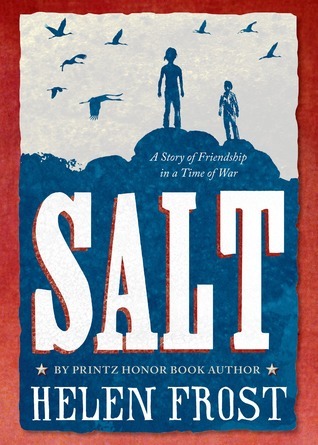 The twelve year old friends fight to survive a tough winter in “Salt: A Story of Friendship in a Time of War” (Frances Foster 2013) by Helen Frost. The Miami Indians weave mats of cattail reeds, which they stuff with moss for the walls of their homes. The poems in Anikwa’s voice are shaped like diamonds and triangles to replicate the traditional Indian weaving work. Will his people fight alongside the Americans? Or with the British who claim they will allow the Indians to remain on their homeland? James, the European American, speaks in long parallel lines like the stripes of the American flag. His family’s values align with the Indians who are stewards of the earth. But there are those settlers who prefer to dominate the earth. Will James’ family abandon the trading post—and their Miami friends–and seek refuge in the American military fort? James and Anikwa understand only a few words of each other’s language. Misunderstandings abound yet they forge a friendship. James has much to learn from Anikwa about woodland survival. He sees that in the Miami culture, as in all Native American cultures, generosity is valued. A strong character gives. This is what the Miami do. Give. Frost builds each of her novels with shape poems. The diamond-shaped poems of “Diamond Willow,” each holds a “scar” of bold type. Reading these “scars” offers a deeper message to Willow’s story. In nature they are knots in the willow wood where a branch has fallen away. In “Crossing Stones” the poems of some characters are round like stones. Poems of other characters meander back and forth across the page like the creek bed that houses the stones. In “Keesha’s House” (Printz Honor book) seven teen characters, each with serious problems, tell their stories in sonnets and sestinas, yet their voices sound natural. Frost uses complex forms, which she always describes in the endnotes and that the avid reader can analyze. But always, the story sings out beyond the form. Add to that magic—Frost’s books are all quick reads, with much white space on the page.